Evolve MMA has three convenient locations. These two photos were taken at the Far East Square location. Sometimes by stepping outside of our comfort zone to take on new challenges would help us grow. Also, we would learn to view things from a different angle and gain new appreciation for them. So, I have always encouraged my senior students to go to try at least another martial art; no matter it is only for a short-term or long-term. I believe this way would help their overall martial art development. Additionally, I always remind my students to remain humble no matter how far they think they have reached in their martial art journey or they feel pretty good about their skill. In this fast-food culture that we live in and a traditional martial art world that is full of “Grandmasters” and “Masters”, people are easily lose grounding or lose touch with reality. In fact, the world is so big, if we walk far enough and long enough, we would find ourselves are really small. Stay humble and stay thirsty to learn. On a side note, two of my most favorite combat sports to watch are Muay Thai and MMA, because they allow to use punching, kicking, elbow strike and knee strike. At the end of last year and beginning of this year, finally I had two opportunities setting an example to learn at Evolve MMA in Singapore. The reason that I chose to go there is its Muay Thai coach line-up could very well be the best in world. 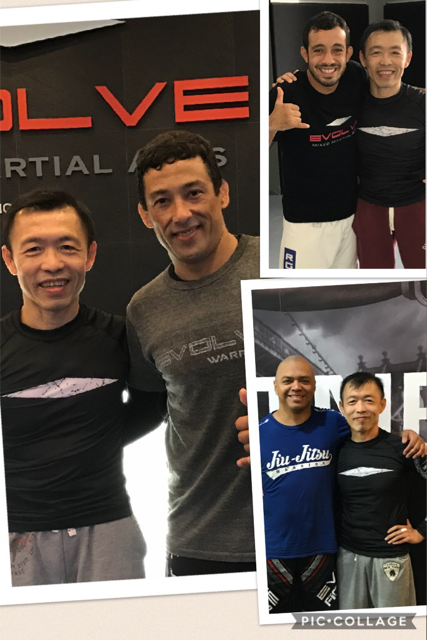 The other reason is Evolve MMA was named by several media (CNN, ESPN…) as the number one MMA gym in Asia; besides Muay Thai, its coaches for MMA, Brazilian Jiu-Jitsu, boxing and wrestling are all top-notched in the world. Although it is in Singapore, I still thought it would suit my needs the best. Honestly speaking, I was worried that my age and health condition (Scoliosis and knee problem) would not allow me to stand the intense training. With perseverance, I was able to tough it out and completed my rigorous training. I learned so much and was very satisfied with my training. On my two trips to Singapore, I mainly spent my time training Muay Thai with the world champions by 1-on-1 private sessions. 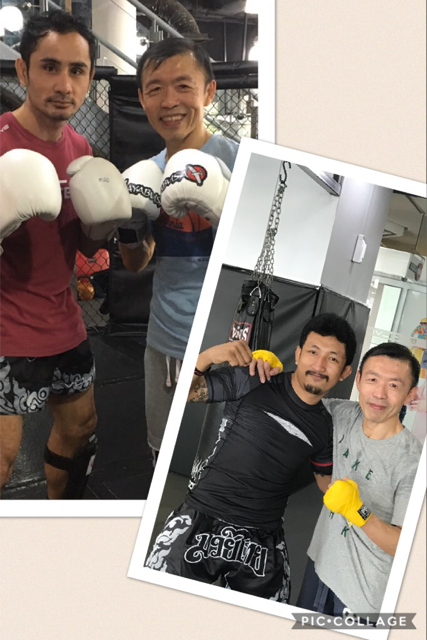 I feel privileged to have these champions help me with pad works, correct my techniques and do sparring. 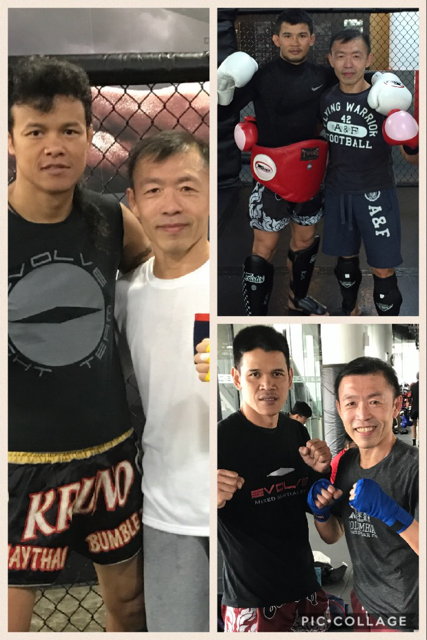 These coaches are considered as “legends” or “superstars” in the Muay Thai circle. 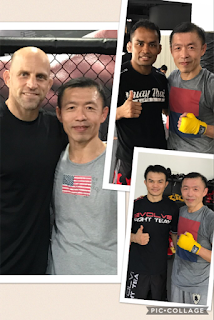 Especially, to be able to do sparring with these instructors with combined of close to 1,500 professional fights was indeed priceless. Although these coaches were fearless and relentless fighters in the ring, they are very nice and kind coaches. This is not to say they are not strict on their teachings. One more benefit of training under these world champions is their fight videos are easily found on the internet, so I could see how they had applied what they taught me in the ring themselves. Besides Muay Thai, I had to take advantage of the broad spectrum of classes that are offered by the Gym, so I took some classes in MMA, BJJ and boxing. Thanks to all my coaches for their great teaching. Also, thanks to Evolve MMA for assembling such a top-notch instructor team. For those who want to learn martial arts from world champions, if you have a chance to stay in Singapore for a period of time, you should go to check out Evolve MMA.